Grouper’s completely scrapping their old site and being reborn as Crackle. The new site aims to discover the top online video talent for their parent company, Sony, by offering producers the chance at fame and fortune. All the old Grouper accounts will be transferred to Crackle . The new property will be a destination video site, consisting of 12 branded channels for different show concepts such as comedy, music news, and animation. The site consists of a channel guide and high quality 16 x 9 embeddable video player. Advertisers will be able to place 5 to 15 second ads between the videos and banner units on the site. 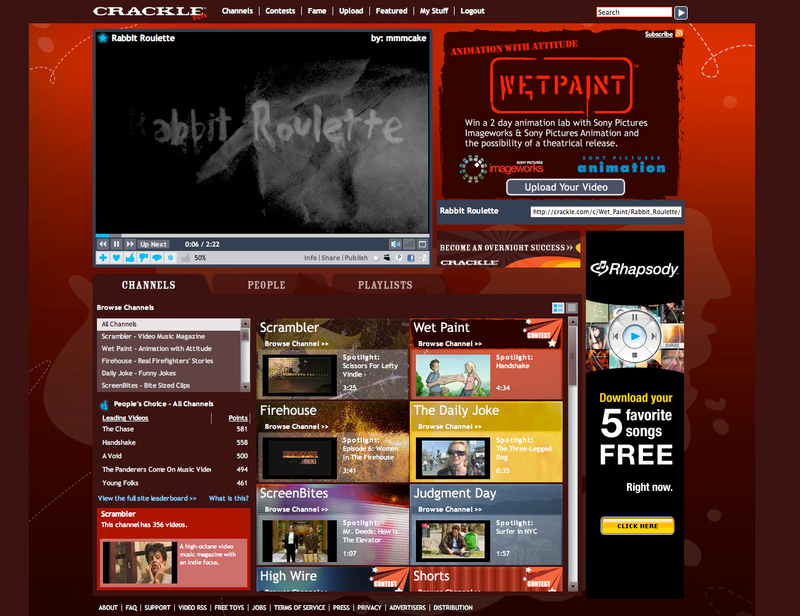 Crackle will seed the channels 1000 of their own professionally produced videos. They will add the top user generated content following the channel’s show concept (comedy, music, etc.) as selected by the community and their team of editors. In return, Crackle will reward the producers in varying degrees, ranging from revenue shares to mid seven figure production deals. All winners will recieve distribution across Sony’s network of hardware and film properties. Sony’s distribution network and 60 person advertising team really pushes this open studio model beyond anything other video startups can currently offer. The site is launching with 4 of the 12 user supported channels. Judgment Day is a channel where the hosts will “judge” other people in the public and then find out if their judgments are right. Scrambler is a video music magazine for indie rock. High Wire is a virtual stage for stand up comedy. Wet Paint is an animation channel. They also have a channel devoted to America’s Firehouses, whose content will be paired with Sony’s “Rescue Me” series. Finally, Moving Targets is a sketch variety channel coming soon. 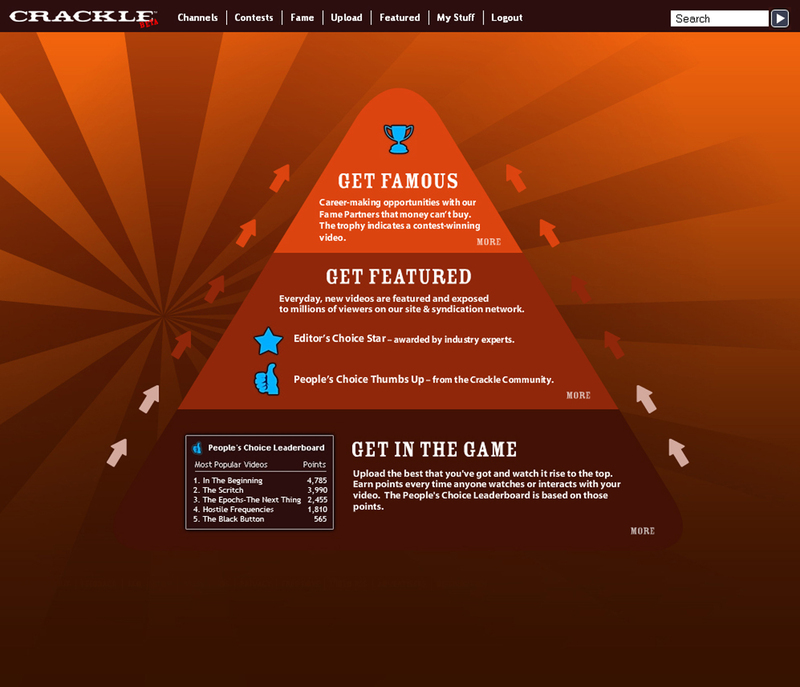 Crackle will allow users to climb the “fame pyramid” as pictured on the right. Anyone will be able to submit a video to the channels, which will be put into a general video library. Viewers will vote for the best videos and during contest periods for special deals, the two top user selected videos will join the editors picks to be chosen for production deals. The possible rewards for producers will vary based on the channel. All the chosen content will be distributed across their network of embedded video players, along with Sony PSP, Bravia, and Sony Vaio. 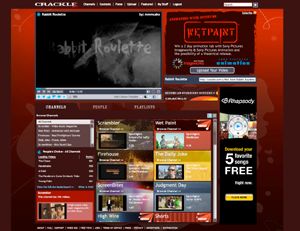 Crackle claims an audience of 25 million unique visitors per month. Quarterly winners of their Shorts and Moving Targets channels will get a pitch meeting with Columbia Pictures about deals produce more videos. Winners on the comedy channels will get the chance to perform on stage at the IMPROV comedy clubs in LA, NY, or Chicago and pitch their shorts to IMPROV Comedy Lab. Animation winners will get a cash prize, the chance to pitch the studio on a theatrical release of their short, and tickets to Siggraph 2008. Their first example is Mr. Deity, a comedy show produced by Brian Dalton, which Grouper lured from YouTube with the promise of greater distribution. Since March, the show’s 10 episodes have received over 5.7 million views. Sony has picked up the show for an additional 10 episodes to premiere on their Moving Targets channel. Crackle is a big shift from the plans originally announced after Grouper turned down a $10 million second round and sold to Sony last August. We reported Sony would use Grouper’s technology to share lower quality Sony videos online, distribute DVD quality video by P2P and allow users to create mashups of select Sony media properties. Both of these ideas were very similar to what Veoh and Eyespot are already doing. 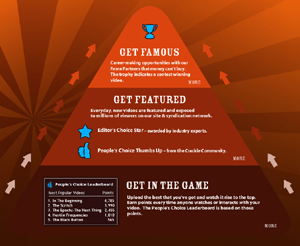 YouTube can still drive more traffic to your videos (this one did over 1 million in a day) and make you famous. However, Crackle has what no other video network has, Sony, which means they can offers top producers access to fatter budgets along with Hollywood style fame. It is a model that can be reproduced with some effort by other sites. iFilm, with it’s parent Viacom, could similarly strike deals with top producers and distribute across their properties. Other social video sites like Veoh, with their P2P player, Joost and Babelgum, while lacking Sony’s clout, could also step into the ring. Increased competition for top content from all of these sites spells good news for the burgeoning internet video industry and may mean bad news for existing video content networks that can’t match what Sony has to offer.